This fabulously renovated retreat is located on the best water ski cove on Lake Hamilton. Nestled in the Little Mazarn section of Lake Hamilton, you and your family will enjoy the seclusion from passing boats while having the best water skiing right at the private dock. Your children will be able to swim and float peacefully around our large dock all day long. The interior has been 100% updated and contains one of the most spectacular master baths in the state. Inspired by the spas that made Hot Springs famous, the master bath is filled with natural light that illuminates the colorful slate and fieldstone that are mined locally. The house entertains wonderfully with its own Tavern complete with SONOS Bar. There is a hot-water shower outside in the private garden. For your enjoyment, the master spa is supported by two 75 gallon hot water heaters. The house features a private tavern for your entertaining purposes. The custom designed bar seats eight for leisure-filled evenings and your guests will delight in the quality of the music provided by the Bose sound system – make sure to bring your ipod! While the adults are enjoying their private oasis, the kids can keep busy in the separate family room. The master bedroom has a king bed and the private spa. Bedroom #2 has two queen beds and an adjoining bathroom. Bedroom #3 has two queen beds and a private bath. Bedroom #4 doubles as home office with Internet hookups, printer, and a twin bed. The house also features a second outdoor shower by the patio so that kids can shower up quickly after a day on the lake. The guest cottage has a queen bed, two twin-size trundle beds, and a small sleeper sofa. The cottage features a private bath, a dinette, and its own washer/dryer. This is an ideal setup for a second family. There is ample space on our 1.5 acre property to park your boat trailer, and our large dock has both covered and uncovered parking areas. Simply stated, you will not find a more fun-filled retreat on beautiful Lake Hamilton. Great home with big kitchen and big bedrooms! We had a great overall experience with this home. This home has spacious bedrooms and cottage is great for 4-6 people. ( this house suits 16 people fantastically) The kitchen is one of the best stocked kitchens in a home that I have rented. The bar area is superb and easily can have 6-8 people hanging out there at any given time. One of our favorite amenities was the ice maker in the bar. Sound system is nice in there too. Master bedroom does have a super nice bathroom that the pictures don’t give full justice to. 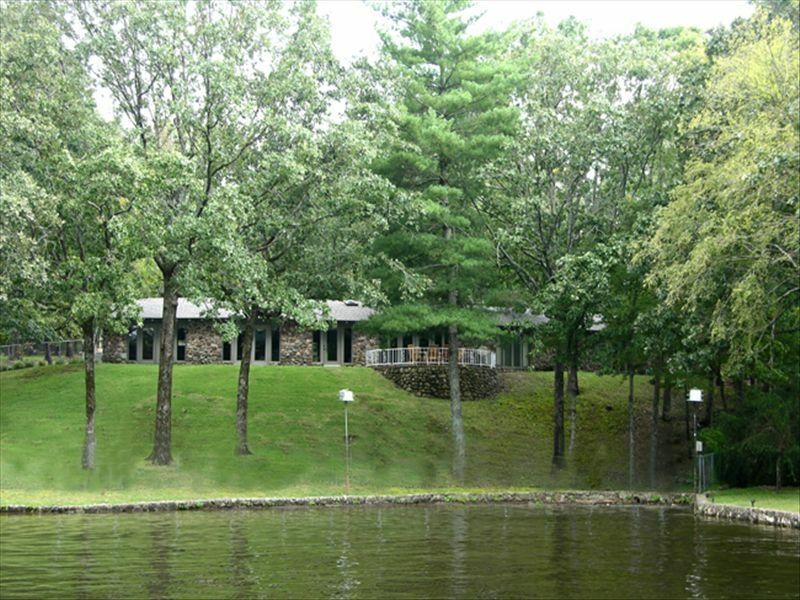 The house sits on a nice lake lot, with a decent dock. We wished we would have brought our kayaks. Owner of the house was nice and attentive. We didn’t really have any problems so we didn’t contact the property managers. Only in the end we had to contact them because someone in our group had left an item and they were very attentive to mail it back to us. Downsides to the home were very minor, there are bottoms missing on the washer and dryer and the television cable is difficult to use. Our family overall had a wonderful holiday week and would always consider coming back if in the Hot Springs area again. We recently stayed here for a family vacation, and it was a BLAST! The house was exactly as described (I was worried because there weren't many pictures)The bar area was the perfect hangout for the adults while the kids hung out in the living room. The living room had tons of games for the kids to play The kitchen was well stocked- short of just a whisk and a non stick pan. The cove was much bigger than we expected and it was not busy at all! The water was clean and clear it was perfect to float, tube, or just relax. The walk to the lake was not bad at all! Other places on Hamilton have super steep walks. It was over all the perfect place for my huge family to stay and we will be coming back!! We enjoyed our stay very much. Plenty of room for 8 adults & 6 kids. The only thing we were a bit frustrated with was the wi-fi was iffy & the tv in the first bedroom with 2 queen beds didn’t work at all. Also the lights were burnt out in the master bathroom. We didn’t mind it to much so we didn’t say anything to the property managers. But over all close to fun activities & very comfortable stay! We will consider this property next time!! Our family of 14 enjoyed this lovely home for three days and had a wonderful time renewing our friendships and reminiscing about old times. We especially enjoyed having the access to the lake, and the boat dock. We ran short of towels the first night but the caretaker was quick to come and provide more and took care of replacing a microwave that was damaged prior to our arriving. We reached our capacity with this property so we will need to look elsewhere if we have more people but I would love to stay here again. Summer Regular Season .. $2850/week Summer Holiday Weeks ... $3550/week Race Season ............ $379/night Off Season ............. $1850/week Monthly Rentals available. Guest cottage rental is additional $500/week during summer and $300 off season Note: Until confirmed, rates are subject to change without notice.